Tom & Billy, originally uploaded by wsdr. It's been 35 years since I went to the Grand Canyon as a kid� August of 1970. It was one of those ......long...... road trips with the parents and 4 kids in a station wagon, plus a camper in tow. 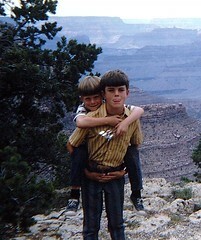 I remember my brother walking me piggy-back up to the edge of the canyon. That must be shortly after this picture since in it I'm not screaming in terror. Even though I was only 5, that trip is burned into my memory. We travelled by car from South Carolina zigzagging across the nation. We made stops in Texas, New Mexico (the Painted Desert was cool), Arizona and on to California (yea Disneyland). We turned north and met my grandparents in Seattle, WA, visited Canada and zoomed back through Yellowstone Park and the Grand Tetons. It was one hell of a trip. And now my family of 5, plus my parents, so 7 total, are doing something similar. This weekend we're flying into Phoenix, AZ, and picking up a minivan (or van, I guess) and heading North. We're going to see Sedona, the Grand Canyon, the Painted Desert, Mesa Verde, Natural Bridges, Dinosaur National Park, the Grand Tetons and Yellowstone National Park. And we're doing this all in two weeks and three days, in the van. All seven of us, ages 3 to 75. Yep, I'm playing dad� or my wife is playing mom, depending on your perspective. Tons of photos, and probably video when we return. I'm liking Flickr more and more.